Do your friends or employees need a well-deserved break from a long week in the office? Would they consider themselves outdoor enthusiasts? Provide them with the gear they need to enjoy the outdoors with a Cabela’s gift card or eGift card. Cabela’s is the World’s largest direct marketer and leading retailer of hunting, fishing, camping and outdoor gear. Founded over 50 years ago Cabela’s has grown to become one of the most well-known outdoor recreation brands in the world and has long been recognized as the World’s Foremost Outfitter. 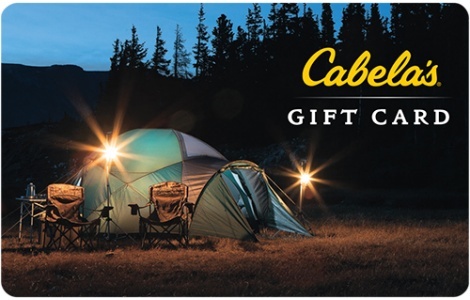 Gift Cards are redeemable online at www.cabelas.com, through our catalog or in any of our retail locations. National Gift Card is the best place for you to order Cabela's gift cards in bulk. We are the experts in all things gift cards and can set up your gift card solutions program for you today. Please contact us for more information on bulk, direct-to-recipient, or individual gift card fulfillment for your gift card program. Contact us online or call us at 888-472-8747 today!